My mother died in February of 1973 after several years of battling cancer. She was only 56 years old when she finally succumbed to the inevitable. My father surprised us somewhat when not long after my mother’s death he began dating although now that I am 15 years older than my father was when my mother died, I now realize that my father at 56 years old was still a young man and very much an eligible widower. His decision to start dating again was really quite normal although some of his early choices of dates scared us a bit like his dating the chatty ex-wife of one of his long time friends and a date(s?) with one of our office secretaries. But soon enough he regained his sea legs and finally in the fall of 1974 he married a lovely woman by the name of Christie Gillespie Fanton. I had the unexpected and fortunate role of serving as his best man. that my nieces and my grand nieces and nephews are all direct descendants of all of the individuals whose stories are covered in the following pages. occasions. It is even possible that some portion of the family’s long trip across the state to Pittsburgh was interrupted by their having to transfer to a canal barge where rail service had not yet been made available to make their way via the canal to the next town where train service resumed. The Mitchell family had left Ireland at the height of the Irish Potato Famine. While it is estimated that a million of the 8 million Irish population starved to death in Ireland during the period of the famine from 1845 to 1850, the worst of the famine problems occurred in the southern and western parts of the island. The Mitchell family lived in County Down in Northern Ireland which while affected by the country’s problems was far less affected that other sections of the country. There is enough prima facie evidence to suggest that Thomas Mitchell and his family were not starving indigent farmers forced to leave Ireland for their survival. In fact quite the opposite is true for several reasons. First, it seems apparent that Thomas Mitchell had a plan when he left Ireland and that plan was to sail to America and settle in Pittsburgh. We know in hindsight that many Irish immigrants who settled in Pittsburgh and Allegheny County during the time period surrounding the potato famine, did not come as a direct result of the famine since most of the new immigrants came from the more prosperous counties in Ireland such as County Down and Ulster. Most of the Irish arriving in the Pittsburgh area were already skilled tradesmen and they came seeking the many new jobs in the area such as in the coal, steel and boat building industries. We can also surmise that Thomas Mitchell was comfortable enough financially to afford the cost of passage for his entire family to America plus the added cost of transportation to Pittsburgh. Finally, in the 1850 U.S. Census we find Thomas Mitchell living in what appears to be a single family home in Pittsburgh with his entire family as well as a young 28-year old Irish girl with a different surname who is most likely a household servant. This suggests that he was not forced out of Ireland for any reason other than to take advantage for himself and his family of the better conditions in America. Thomas was 50 when he arrived in America; his young daughter Diana who would soon marry James J. Gillespie, was listed on the handwritten ship’s manifest as a 20-year old female. The early background of Diana Mitchell’s future husband, James J. Gillespie is a little more difficult to determine. Based on the US Census records from 1860 through 1880 we know that he was born in Ireland between the years 1824 and 1826. We also suspect that he emigrated from Ireland shortly after 1850 since we could not find him in the 1850 US census records. Furthermore, due to the commonality of his name, identifying him in the immigration records proved to be almost impossible. There were more than two dozen James Gillespie’s who immigrated to the United States from the British Isles around the 1850 period. Even the two most likely candidates, a James Gillespie who arrived in Philadelphia on June 5, 1847 and a James Gillespie who arrived in Philadelphia on January 16, 1850, may not be our James Gillespie since their listed birth years, 1827 and 1822 respectively, fall outside the range of birth years for James J. Gillespie listed in the census records. It is intriguing however, that the arrival date of June 5, 1847 for the one James Gillespie coincides exactly with the arrival date of his future wife Diana into the port of Philadelphia although we know that they arrived on different ships from different departure ports. Nevertheless, it would make a wonderful love story to discover that they met each other on the long train ride from Philadelphia to Pittsburgh. Alas, the actual truth shall remain a mystery. There is strong circumstantial evidence to conclude that James J Gillespie like the Mitchell family was born in Northern Ireland. While there is some ongoing debate as to whether the surname “Gillespie” originated in Gaelic northern Ireland in the 5th century or in Scotland, in both cases there seems to be agreement that in Ireland the surname Gillespie is chiefly recorded in County Down, Providence of Ulster, in Northern Ireland. Even if the Gillespie ancestors originated in Scotland, they were probably among the 100,000 Scottish lowlanders who came to Ireland in the 17th century and settled in northeastern Ireland. It is even possible that our James Gillespie is related to the famous Irishman Sir Robert Rollo Gillespie (1766-1814) who was born in County Down and had an adventurous and distinguished career as a soldier in India where he was killed in action. Further evidence that James Gillespie was from Northern Island is that his family were Presbyterians and not Roman Catholics as were the vast majority of the Irish immigrants from other areas of Ireland during the period of the potato famine. One final and romantic speculation must be offered. Since it appears entirely possible that James J. Gillespie might have been born in County Down and we know that Diana Mitchell was born in County Down then we cannot entirely rule out the possibility that they may have known one another in Ireland and James followed her to America. “carpenter”, age 40, born in Ireland and living in Pittsburgh’s 9th Ward. In both the 1870 and 1880 US Census records he is listed as a “Lumber Dealer”. 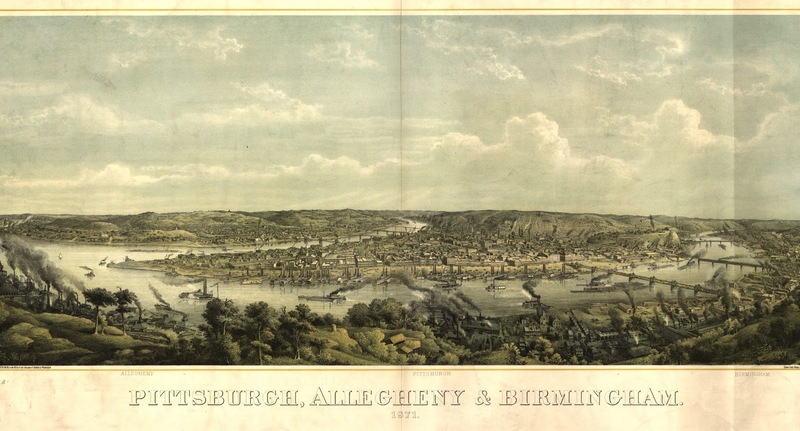 We learn from a book titled “Pittsburgh and Allegheny in the Centennial Year” published in 1876, that James Gillespie established in 1859 the firm of Gillespie and Mitchell that dealt in the manufacturing and sale of planed (finished) lumber. It is not clear as to who the Mitchell partner was as none of his Mitchell brother-in-laws appear to have been engaged in the lumber business at any time during their lives (per census records). Apparently, the partner must have been James’ father-in-law, Joseph Lindsey Mitchell, who probably loaned James the seed money to get his new business underway. 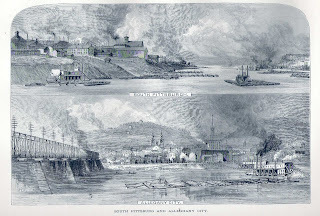 The Gillespie and Mitchell factory was located on 21st and Railroads Streets in what is now downtown Pittsburgh and its location was ideally situated as it was directly on the Allegheny River and was surrounded by railroad tracks. This meant that the raw lumber (freshly cut trees) could be shipped in by barge down the river from the forested areas of western Pennsylvania and then unloaded directly onto the Gillespie and Mitchell factory docks. Then after the trees were milled into “planed lumber”, they could be immediately loaded onto the train cars sitting on the adjacent railroad tracks for shipment to their customers. In the second half of the 19th century Pittsburgh was the epitome of a “factory town” and by today’s standards, an environmental disaster. The shorelines of the “three rivers” of Pittsburgh were lined with factories whose smokestacks polluted the air with carbon dust, and whose sewer drain pipes sent the untreated factory waste directly into the rivers. 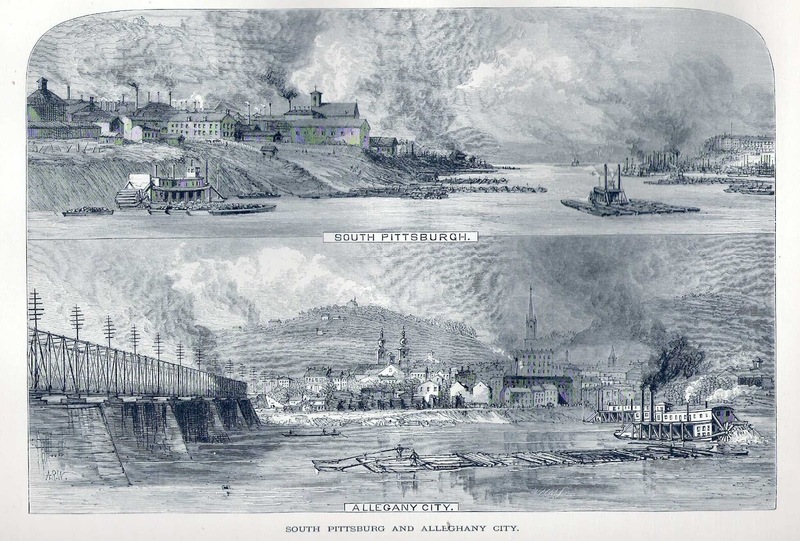 Many of the industries were huge contributors to the pollution especially the coal and steel industries that were to make Pittsburgh so famous. The residents of Pittsburgh, including the Gillespie and Mitchell families, lived nearby the factories and they must have experienced a daily “rain” of carbon dust on and into their homes, their yards, onto their freshly washed clothes that were hung out to dry, and no doubt into their lungs. James J. Gillespie was probably not an educated man and it is possible that he was never taught to read and write or even sign his name. While we are not sure that it is our James Gillespie, there was a Naturalization paper signed on December 19, 1851 in the “Western District of Pennsylvania” by a “James Gillespie” from Ireland. He signed the form by placing his “Mark” on the bottom of the paper. We also know that at least two of James’ and Diana’s children, Thomas Andrew and David Lindsey Gillespie, had trouble in or never completed high school. On the other hand, both of these boys went on in their adult lives to become hugely successful businessmen, so I think that it is safe to assume that what James did was to embolden his children and these two boys in particular, with a keen business sense and the motivation and aggressiveness necessary to work hard and to let nothing stop them from achieving their goals. Their son David Lindsey Gillespie, my stepmother Christie’s great uncle, went on to form his own lumber business in 1886 at the age of only 28. He ultimately became even more successful than his father and according to his biography included in the 1905 publication of the “American Lumbermen . . eminent lumbermen of the United States” he was “one of Pittsburgh’s leading and very successful businessmen. During its first year in the lumber business the Gillespie concern handled less than 3,000,000 feet, but in 1902 its output was 70,000,000 feet.” David Gillespie’s biography also tells us something about the end of his father’s business. It reads “The father was one of the largest retail dealers in western Pennsylvania, and until his mill burned down and serious financial difficulties followed, did the phenomenal business of those days, 3,000,000 feet a year.” According to the biography, the mill must have burned in 1775 because that is the year that David Gillespie stopped working for his father. While there is no reason to doubt the accuracy of the biography with respect to the burning of the lumber mill, it is interesting to note that James Gillespie in the 1880 US Census, five years after the fire, still reported his occupation as that of a “lumber dealer” and in the 1876 publication referenced above about the centennial of Pittsburgh, it still lists the Gillespie and Mitchell Company as an existing lumber business. The factory probably did burn and James Gillespie probably did have financial difficulties trying to keep it going and maybe he was partially successful. He was however, 50 years old when the plant burned and perhaps his struggles thereafter to rebuilt his business may have accounted for his relatively early death at the age of only 64 on September 4, 1889. His wife Diana Mitchell Gillespie outlived her husband by 16 years finally passing away April 25, 1905. They are both buried in the Allegheny Cemetery located near their home and their business and a just few miles from the high rise buildings of present day downtown Pittsburgh. My stepmother Christie’s grandparents, Thomas Andrew Gillespie (1852-1926) and Julia Burford Wall (1855- Aft 1940), were married in Pittsburgh on January 7, 1875. Their marriage is a fascinating combination of two individuals with two entirely different family backgrounds. Thomas’ family as we have seen, grew up in the heavy industry of Pittsburgh. They were hard driven businessmen with type A personalities and analytical thinkers who used the right sides of their brains. On the other side, Julia Wall’s brother, father, uncle, and grandfather were all artists who were all obviously creative thinkers. The modern belief is that predominately creative people use the left sides of their brains. So on January 5, 1875, the right brains headed up by Thomas’ father James Gillespie, socialized with the left brains headed up by Julia’s father William Coventry Wall (1810-1886). We could make up a great story about the wedding conversation, but we will not. Anyway, before we return to the Gillespie side of Christie’s family, we will have at look at the very interesting Wall side of her family. William Wall was born in Oxford, England in the year 1767. There is little known about his upbringing although some family historians believe that he was born to wealthy and educated parents and based on his later artisan calling, they might very well be right. The oldest son takes over the family business and the younger sons join the military, enter the ministry, or in William’s case, learn a trade. William was probably apprenticed at a young age and taught to paint and learn other art skills that were marketable such as working with stone carvings which were in high demand in England and used in the construction of cathedrals and other stone buildings possibly even at the university. He may also have been taught to sculpture the elaborate gravestones that were in common use in churchyard cemeteries throughout Oxfordshire. William Wall was in his early 40s when he married 20-year old Lucy Hardiman around the year 1809. It seems likely that this was not his first wife although there are no known existing records to support an earlier marriage. Family historian Dr. Betty Jane McWilliams speculates that William meet his future wife while she was attending a school for young ladies that was being run by William’s mother. Whatever the circumstance of their meeting, William and Lucy had three children before they left England for America including Christie’s great grandfather William Coventry Wall who was born in April of 1810. It is really a mystery as to what motivated William Wall to move with his family to America around the year 1820. Immigration to America from England and Europe in 1820 was practically at a standstill with only 8,385 new immigrants signing naturalization papers during that year. In 1820 the population of the United States is estimated to have been approximately 10,000,000 people with almost 99% of these American citizens born in this country. Unlike the early years of our country’s growth, there were no major driving forces in Europe such as persecutions or famines that motivated people to leave their homelands. During the decade of 1820 to 1830, only 143,000 new immigrants entered America. In the following decade of 1830 to 1840, immigration rose to 599,000 new arrivals, however in the 1840-50 decade immigration increased dramatically to 1,713,000 with almost 781,000 of the immigrants arriving from Ireland. We do not know what motivated William to leave England in 1820 but we know it was not likely due to poor conditions in Oxford or in England. On the other hand, beginning in the 1820s, the United States was gaining a reputation as an emerging industrial nation and this knowledge would probably have attracted artisans and skilled workers like William Wall to leave their homeland to try their luck in America. It is still baffling as to why then 53-year old William Wall with his 30-year old wife and children, who ranged in age from 2 to 11, left their home in England. 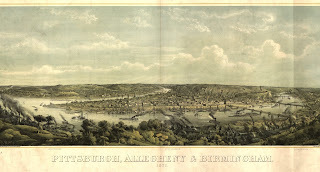 Once they arrived in New York City after their long voyage by sailing ship, they purchased a horse and wagon and proceeded to travel almost 400 miles over a system of dusty and rutted dirt roads to a new home in Mount Pleasant, Pennsylvania located about 45 miles southeast of the town of Pittsburgh. We have to wonder whether they had a master plan when they left England to eventually settle in Western Pennsylvania. If this were the case, the next mystery has to be why did the Wall family not sail directly to the Port of Philadelphia from England which would have been a far more logical thing to do if their plan was to settle in Mount Pleasant or Pittsburgh. By 1820 the final leg of the original “Pennsylvania Turnpike” was completed which allowed travelers a continuous trail from Philadelphia to Pittsburgh, a distance of 330 miles (at least on Interstate 70 today) which was a significantly easier and shorter than the trip from New York. The evolution of transportation through Pennsylvania is an interesting study. From the time period following the American Revolution to around 1800, travelers crossing Pennsylvania had to make their way along old Indian trails or down rivers such as the Susquehanna. The first turnpike in Pennsylvania began in 1792 and it connected Philadelphia to Lancaster. “Turnpikes” were “private” roads constructed by private individuals or corporations who hoped to show a profit from the fees that they charged travelers who wished to use their turnpikes. It is estimated that between 1800 and 1830 there were almost 200 turnpike corporations in existence in Pennsylvania. These turnpikes were in many cases poorly constructed and the weather and their intensive usage took a heavy toll on the road surfaces. By the 1840s, in an effort to reduce their long term maintenance costs, the road owners began covering the road surfaces with wood timbers hence the term “Plank Roads” was coined. Notwithstanding the major expansion and improvements to the road system in Pennsylvania in the early 1800s, hauling supplies via the roads was very slow and very expensive. While canal construction had begun in Pennsylvania as early as the late 1700s, it was not until the completion of the Erie Canal in New York State in 1825 did Pennsylvanians begin to construct canals in earnest. Following a huge infusion of cash by the Pennsylvania Legislature, by 1840 the “Main Line” canal officially opened that allowed canal service between Philadelphia and Pittsburgh. While hauling goods and travelers via canals was vastly less expensive, unfortunately, as is often the case in our capitalist system, canal traffic in Pennsylvania peaked about the time of the opening of the Main Line in 1840 with the expansion of railroads. Hauling by rail was even less expensive than by canal, it was faster, and unlike the canals, rail service could continue through the cold winter months. Obviously, William Wall was unable to take advantage of the benefits of travel by rail or canal in 1820 and his journey to Mount Pleasant must have taken many weeks. James Gillespie on the other hand who traveled to Pittsburgh from Philadelphia in 1850 and his in-laws who made the same trip in 1847 were transported in relative comfort and arrived by rail in a matter of days. Today a drive on the Pennsylvania Turnpike from Philadelphia to Pittsburgh takes around 5 hours and the flight time on US Airways can be accomplished in just over one hour. Town lots were original laid out for the village of Mount Pleasant in the year 1797 although the farm land surrounding the new village had been occupied many years earlier. By 1810 most of the town lots were sold and the village contained 34 log homes as well as a number of businesses including an inn and tavern, a blacksmith shop and livery stable, and a mercantile and feed store, and of course, on Church Street the “Meeting House” (the church) and the graveyard. 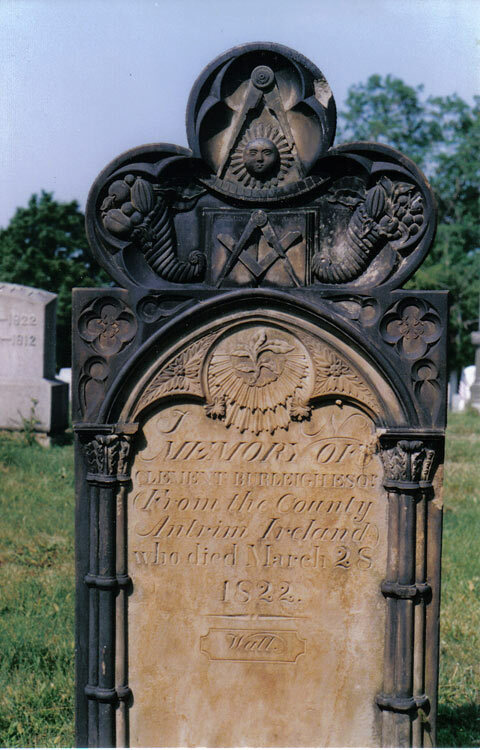 William Wall was not the only tombstone carver in the area when he arrived in 1820, although as the quality of his work attests, his services were undoubtedly in high demand. One of his earliest commissions and perhaps his finest carving (see photograph) was for the tombstone for a man named Clement Burleigh who had died in 1822. Burleigh was one of the leading citizens of Mount Pleasant and it was he who had donated the land for the Meeting House and the graveyard back in 1802. William Wall went on to carve many more tombstones in at least seven cemeteries in both Westmoreland and Fayette Counties. His stones are recognized because of his engraved “signature” on the tombstones as can be seen in the photograph of the Burleigh gravestone. Just as we wondered why William Wall left “the majestic spires of Oxford” and migrated to America and to Mount Pleasant, we have to wonder why in the early to mid-1830s William decided to leave “the bucolic charm of Mount Pleasant” and relocate to the urban factory town of Pittsburgh noted for “Its dark, satanic mills” and as Charles Dickens noted when he wrote about the city in 1842 that it had a “great quantity of smoke hanging over it”. William Wall was in his mid-60s years at the time and it seems incredible that he would want to retire to such an environment. The population of Pittsburgh in the mid 1830s was approaching 20,000 and the filth from the factories and the additional traffic created by the growing population must have seemed like pollution was increasing on a daily basis. That hardly seems like an environment that would endear an artist. We do not know the exact year that William Wall and his family moved to Pittsburgh. What we do know is that his oldest son, 25 year-old William Coventry Wall, married a Pittsburgh girl, Catherine Anne Perry Westervelt, on August 26, 1835 which suggests that the family moved the city sometime prior to that date. William Wall may very well have moved to the larger city to improve employment opportunities for himself and more importantly, for his children’s future who in 1835 numbered six and ranged in ages from 5 to 25 years old. The only evidence suggesting that William continued his tombstone carving business in Pittsburgh is that he was listed as a “carver gilder” on the 1850 US census. He was 83-years old in that year and to my knowledge no one has located any of his carvings in any cemeteries in the Pittsburgh area. When William died at the age of 90 in 1857 he was buried in the Allegheny Cemetery in Pittsburgh. Ironically and unfortunately no tombstone or great work of art was placed over his final resting place. His wife Lucy who survived her husband by eight years and at least three of their children, are buried in the same cemetery. Some historians have suggested that William Wall may have operated a school for artists both in Mount Pleasant and later in Pittsburgh. 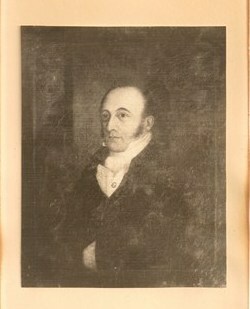 While we know of no documentation to support this belief, the knowledge that two of William’s sons, William Coventry Wall and Alfred S. Wall, went on to become nationally recognized artists, strongly suggests that their father both influenced his sons and most likely trained them in the art of painting. It is no real stretch of the imagination to assume that his teaching of art may have been extended to others. After William’s marriage to Catherine “Katie” Westervelt in August 1835, the couple apparently moved to Louisville, Kentucky where their first three daughters were born between the years 1836 and 1839 and where William operated a small arts and frame supply shop that specialized in “looking glass” or framed mirrors. The profits from the shop apparently helped William support his new and rapidly growing family while he continued to develop his skills as an artist. In 1841, William and his wife and three daughters returned to Pittsburgh where William again opened up a picture frame and arts supply store in the downtown area of Pittsburgh on 4th Avenue between Wood and Market Streets. According to Betty Jane McWilliams who wrote the book on the Wall family titled “The Four Walls”, newspapers at the time advertised William as a plain and fancy portrait and picture frame manufacturer and a seller of artist supplies, paintings, and engravings for sale. We have to wonder if possibly some of the engravings that were sold in the store were actually crafted by his father. William’s home fortunately was located across the Allegheny River in Allegheny City for in the morning hours of April 10, 1845 sparks from a outdoor fire started by a careless washerwoman started a fire at a nearby wooden structure at the southeast corner of Ferry and 2nd Street in downtown Pittsburgh and in a matter of minutes an out of control inferno was ignited that burned most of the day and destroyed almost one third of the “best half of the city”, almost 60 acres in total. Hundreds of buildings including homes, factories, warehouses, stores, docks, and even a bridge were left in ruins including William C. Wall’s small shop that was located only a few blocks from where the fire began. 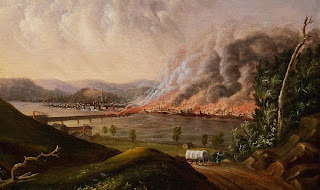 While William probably lost the building and the entire contents of his store, the Great Fire of Pittsburgh of 1845 was for William at least sort of a blessing in disguise. 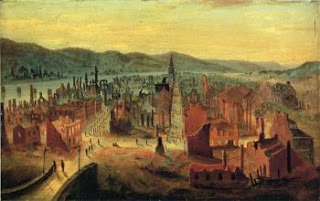 Shortly following the fire William Wall painted several scenes of the city during the fire and of the destruction following the fire and he decided to have lithographs made of his paintings. The lithographs sold very well in cities as far away as Philadelphia and suddenly William found buyers starting to pay attention to his art work. Over the next four decades William C. Wall crafted dozens of paintings and sketches. While he advertised that he would paint portraits and special paintings such as homes for a commission, his real love was that of landscape painting. 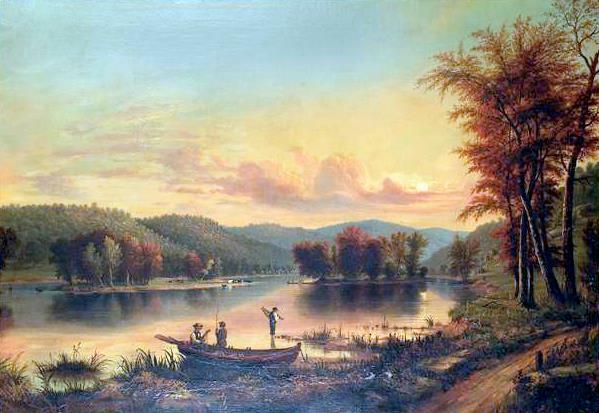 In the late 1860s he was part of a group of local artists that included his brother Alfred S. Wall, who spent time together each summer painting scenes in a mostly unsettled area southeast of Pittsburgh near Johnstown, Pennsylvania. This group of painters later became known as the Scalp Level Painters named after the borough of Scalp Level where they spent their time painting. During his lifetime, William traveled extensively painting landscape scenes in the Monongahela, Allegheny, Conemaugh, and Susquehanna River valleys in Pennsylvania and as far north as New York where he painted a scene along the Erie Canal and a view of the Niagara Falls. The exact number of paintings that William C. Wall painted and sold during his lifetime is not known although the number probably totals upwards of 50 to 60 or more. A search on the internet identified at least 40 of his major art pieces and that list likely excludes many of the paintings that he did on commission for private buyers as well as paintings that have been lost or not identified as his. It also excludes the many decorative banners that he painted for the local fire companies in the late 1840s and theater scenery paintings that he did for the Pittsburgh Company. It is also reported that William Coventry Wall along with an artist friend of his painted dozens of paintings for a luxury river steamboat, the Grand Republic, that ran down the Mississippi beginning shortly after the end of the Civil War. The majority of Wall’s known paintings are held by individual art collectors although a number of them are in art galleries such as the Carnegie Museum of Art in Pittsburgh where his famous paintings showing the Pittsburgh fire are on display. The current value of a William Coventry Wall painting is difficult to determine since his art work is seldom sold in public auctions and of course each painting in any case, would have a different value. It is estimated that a typical W.C. Wall painting will sell today for somewhere between $20K to $40K. On the other hand, his “View on the Allegheny River” (see painting to the left) sold for $59,375 in 2010 and his paintings showing the scenes of the 1845 Pittsburgh fire are worth considerably more. William Coventry Wall died in a hospital on 19 November 1886. Two months earlier he had suffered a stroke which left him paralyzed on one side. The ultimate cause of his death however, was listed as kidney failure. His legacy of course, are his numerous works of art but we also must be impressed by the nature of this man who worked hard all of his life to support his family and who freely and willingly passed down his talents to many younger artists who were to follow him. Thomas Andrew Gillespie, the oldest son of James J. Gillespie and Diana Hawthorne Mitchell, was born in Pittsburgh, Pennsylvania on 1 July 1852. Based on a book by George T. Fleming that briefly describes a history of the Pittsburgh Central High School from 1855 to 1871, we learn or at least there is a suggestion in this book, that Thomas Andrew Gillespie did not graduate with his high school class of 1866. Whether Thomas later went back to earn his diploma is not known although he is not listed as an 1867 graduate and by the age of 16 (almost 17) in June of 1868 he went to work as a clerk for the Pittsburgh Gas Company. We strongly suspect that in the Gillespie family the importance of getting a good education was secondary to the importance of obtaining employment, maintaining a strong work ethic, and aggressively pursuing ones goals. If Thomas failed to complete his high school education it does not appear to have slowed down his meteoric rise in the business work and it would appear that well before his 50th birthday and before the turn of the century, Thomas Andrew Gillespie had amassed a net worth of well over a million dollars. He was undoubtedly aided in his efforts to gain wealth by our country’s lack of any federal income tax before 1894, at which time a 2% income tax was applied on personal income over $4,000, and by the almost total absence of Federal regulations, corporate oversight and corporate income taxes. Furthermore, the period of 1865 to around 1900 has been called the “Gilded Age” in American history as a result of the huge leap during these years in our manufacturing output and the strong economic growth in our country. In the article in Wikipedia that discusses this gilded age in our country’s history, the author notes that this period was an “epoch of tycoons.” He was referring to the fact that conditions in our country were ideal for entrepreneurs, men such as Thomas Andrew Gillespie, who were willing to take a risk, who if successful in their efforts were able to accumulate vast sums of money. Thomas Andrew Gillespie remained with the Pittsburgh Gas Company for only two months before he changed jobs shortly after his 17th birthday and accepted a position with Lloyd & Black Iron Manufacturing in August of 1868. In 1871, again sensing a new opportunity he went to work for the relatively young firm of Lewis, Oliver & Philips, a manufacturer of iron, wagon, and heavy hardware. According to “The Story of Pittsburgh & Vicinity” published in 1908, Thomas Andrew Gillespie worked as a “traveling agent” for this firm which I interpret to mean that he was a salesman. For whatever reason, Thomas left the firm in 1879 after eight years and at the age of only 27 he opened up his own business which according to his biography in the book mentioned previously, his new company “manufactured iron bolts and kindred articles.” A very similar business to the one he just left. Perhaps Thomas may have disagreed with this description of his company for in the 1880 U.S. Census he told the census taker that he was a “Tank Manufacturer.” Whatever the exact nature of his business, it is not surprising to learn that in the first ten years of Thomas’ working career, he was engaged in one way or another in the iron and steel industry, the industry so closely associated with Pittsburgh. On 7 Jan 1875, James Andrew Gillespie married Julia Burford Wall, the daughter of the well known Pittsburgh artist William Coventry Wall and his wife Catherine. It is fun to speculate but there is no way of knowing for sure when and where James met his future wife Julia. She was two years older than James and came from an entirely different background. Both Julia and James were probably still living with their parents just prior to their marriage, at least they were at the time of the 1870 U.S Census, and their parents were not living in the same neighborhoods. At the time of their marriage James was a 22-year old, struggling self-employed businessman and it seems unlikely that he met Julia at a social function. On a purely speculative basis, we believe that Julia meet James because she either worked for his company or for a related firm and their encounters eventually lead to romance and marriage. However they met, their first son, Thomas Howard Gillespie, was born nine months and 21 days after his parent’s marriage. They went on to have a daughter, Jean Gillespie, born in 1886, and two more sons, Henry Lloyd Gillespie, father of our Christie MacDonald Gillespie, born in 1878, and James Parke Gillespie, born in 1889. Perhaps as a result of his growing family and the need to have a steady source of income, James Andrew Gillespie closed his business in 1884 and went to work for a man named George Westinghouse who had purchased a charter from a company named Philadelphia Company which included the rights to install natural gas to many of the wealthy homes in Pittsburgh. George Westinghouse, who several years later founded Westinghouse Electric, must have seen something in James A. Gillespie who was only 32 years old at the time. During the period that James Gillespie worked for the company as a primary supervisor, the company went on to install underground gas lines to thousands of homes in Pittsburgh. Clearly, this position gave Thomas Andrew Gillespie, the confidence and experience that he needed to forge forward on his own in the future. We suspect that an inheritance from his father who died in 1889 provided some additional capital which allowed him in 1890 to form his own contracting company, the T. A. Gillespie Company. Sometime prior to June of 1890, probably in mid to late 1889, the Gillespie family relocated to the Town of West Orange in Essex County, New Jersey. Their new home was located on South Valley Road in West Orange in a neighbor of new and expensive Victorian style homes. According to the 1930 US Census, their home had an assessed value of $200,000 which would have an equivalent value today well in excess of $1 million. We know that their home was large simply by the fact that in 1890 it housed the Gillespie family of six plus six servants ranging in age of between 28 and 40 years old. In the 1930 US Census, the census taker wrote opposite the names of the occupants of their home which then consisted only of Julia Gillespie as Thomas had died in 1926, and her servants, the words “Silver Spring Estate.” We assume that this was what the family had named their house and grounds. Their original home which we believe has been long demolished was probably located in the area where Silver Springs Road intersects with South Valley Road. Homes in this area are currently valued in the $250K to $400K range and we believe that they are much smaller than the original Gillespie estate. Thomas Gillespie’s home in West Orange was located about 1-1/2 miles from Thomas Edison’s mansion. Julia Wall Gillespie sold her Silver Spring Estate home around 1935 and she moved in with her daughter Jean and her husband and her grand children who were living in New York City. 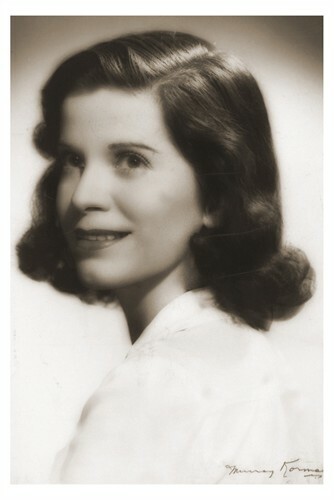 Julia was still living at their home at the time of the 1940 US Census. Between 1890 and the time of his death in 1926, Thomas Andrew Gillespie accumulated great wealth largely we believe as a result of the success of his construction company, the T.A. Gillespie Co. The company specialized in what might be called “heavy construction” projects as opposed to “building construction.” This work consisted largely of water, sewer, and gas pipelines which they constructed throughout the eastern United States, as well as the construction of canals, locks, reservoirs, and dams, pumping stations, tunnels including tunnels for water aqueducts as well as for subways systems in and around New York City. The adjacent photograph that was taken in 1906 shows T.A. Gillespie Company workers installing a water pipe in Pittsburgh. Some of their more famous construction projects included several multi-million dollar contacts that were part of the construction of the Catskill Aqueduct built to transport water from the Catskills to New York City that was constructed between 1907 and 1916. T.A. 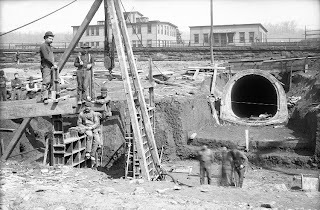 Gillespie Company not only constructed a 4-1/2 mile underground aqueduct but in another contract provided a 1,200 foot tunnel for a portion of the water aqueduct installed under the Hudson River. In other large contracts the T.A. Gillespie Company built a huge water infiltration plant for the City of Pittsburgh, a canal at Messena on the St Lawrence River, and major subway tunnels both in New York and Brooklyn. The company was so highly respected that they were asked to joint venture with the MacArthur Company to submit a bid on the construction of the Panama Canal in 1906. 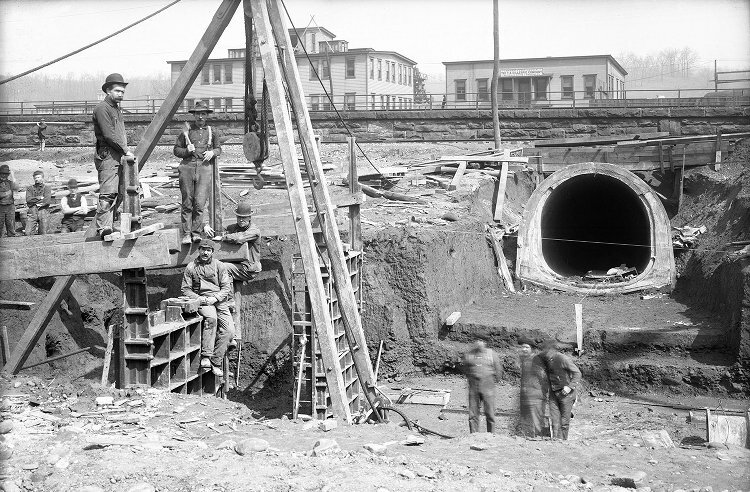 MacArthur Company was one of the lead contractors on the construction of the Catskill Aqueduct and obviously had been so impressed with Gillespie’s work on the Aqueduct project that they invited Gillespie to work with them on constructing the Panama Canal. Unfortunately for both companies, their offer was not the low bid. In 1913, the T.A Gillespie Company along with a few other firms was investigated by a committee of the New York Legislature for possible corruption, namely a charge that these firms had offered bribes to public officials to obtain public construction contracts principally for the construction of the New York subway system. No evidence of corruption was uncovered. 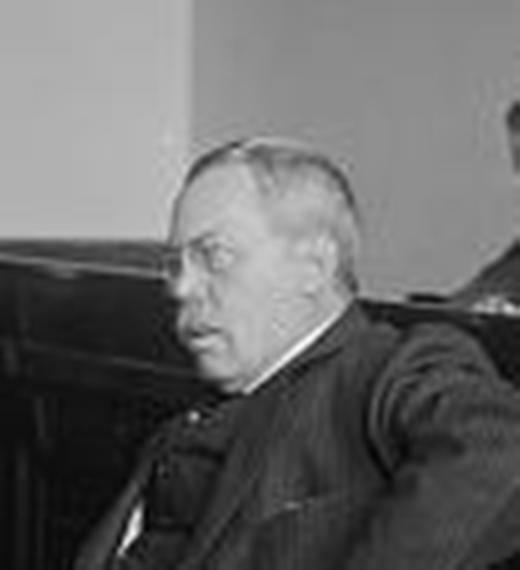 What was really interesting in the course of the hearings were the comments offered by Theodore P. Shonts, President of the Interborough Rapid Transit, with respect to Thomas Andrew Gillespie and his company. These comments included the following statements: “Gillespie is the greatest sub-surface expert living in the work,“ and “ The greatest water pipe man in the engineering work,” and finally “. . a great organizer, great driver, and very skillful in the part of the work we had to do with opening all of the street.” It would seem that Thomas Andrew Gillespie’s success was clearly a result of his ability and the effectiveness of his company. It also seems that Gillespie’s success was also due to his willingness to take high risks under circumstances where success might lead to high financial rewards. The type of construction contacts that he accepted were inherently risky and undoubtedly yielded profits in the 15% to 25% range. We also see that Thomas Gillespie invested in numerous other types of businesses. We encountered a few that we will mention although there were probably many others. In the early 1890s, Gillespie invested in the Central Tractor Company which operated a cable car in the City of Pittsburgh. In 1894, we find Thomas A. Gillespie listed as Treasurer of a company named American Steel Forge Company that manufactured wagon hardware. In 1914, Gillespie entered into a garbage collection contract with the City of New York. Thomas Gillespie concluded before he accepted the contract that he could recycle the garbage and actually sell the recycled end products which he thought would be grease and fertilizer, at a profit. One of the garbage collection contract terms was that he would pay the city for the right to collect the garbage. Unfortunately this little business failed and he ended up losing a lawsuit with the City and paying them $110,000. The largest and most visible of Thomas Andrew Gillespie’s extracurricular business operations was his $12.7 million dollar contact with the United States Government in 1917 to manufacturer munitions for the War, World War I. Unfortunately this business which operated at a plant in Middlesex County, New Jersey, ended rather dramatically on 4 October 1918 when an explosion caused a fire which set off a series of subsequent explosions over the next three days. Not only was the large manufacturing plant completely destroyed but hundreds of homes and other buildings surrounding the plant were also destroyed. Over 100 people died and hundreds more were injured. Thomas Andrew Gillespie obviously lost his huge investment in the T.A. Gillespie Company Shell Loading Plant. There is no record of any civil or personal lawsuits against Thomas Gillespie although it is known that the US Government paid out millions of dollars to area residents to cover the damages. After the war we do not hear much about the T.A. Gillespie Company and Thomas A. Gillespie. Thomas listed his occupation in the 1920 US Census as a “Manufacturer” and from other sources we know that he appears to have partnered with his old boss in some way, George Westinghouse, to manufacture washing machines. In 1920 Thomas Gillespie was 68 years old and he was undoubtedly considering retirement or at least refraining from taking an active role in managing his businesses. What exactly happened to the T.A. Gillespie Company after 1920 and after Thomas Andrew Gillespie’s death in 1926 was not determined. We know that all three of Thomas’ and Julia’s sons were involved in the business at one time or another as was their daughter’s husband, their son-in-law, Harry Seaver Jones. Their oldest son Thomas Howard Gillespie and their son-in law, H. Seaver Jones, appear to have continued in the contracting business after Thomas’ death and most likely they worked together. In the 1920 Census they were both involved probably with Thomas in setting up the washing machine manufacturing business but then in both the 1930 and the 1940 census records they listed themselves as contractors, in one case as “Building Industrial” and in other case as “Contacting Municipal Line.” It is unclear what their second oldest son, Henry Lloyd Gillespie, did for a living although in 1917 he was listed as the Assistant General Manager of the T.A. Gillespie Shell Loading Plant a position that abruptly ended in 1918, and in the 1920 Census he listed himself a “Building Contactor Houses.” Henry died in 1929. There will be more about his life below. We know the least about the occupations of their third son and youngest child, James Parke Gillespie. In the 1930 Census, he was listed as a manufacturer of “Connector Machine [bolts? ]” which was probably one of his father’s companies. No occupations are mentioned for him in the 1920 and 1940 census records. It does appear that none of his sons had the skills and drive of their father. It would also seem likely that the sons and the daughter inherited large sums of money when their father passed away in 1926 which by itself eliminated some or most of the need for them to carry on the business as a source of income and wealth at least in the manner that Thomas Andrew Gillespie pursued that goal. We know from our research that Thomas Andrew Gillespie’s life was not all work and no play. He was a chairman or director of a number of unrelated companies to his own business which reflects the respect that others had of his abilities. He was a member of a number of associations and societies and he was an active member of the Presbyterian Church. For recreation he was an avid golfer and he loved the “sport” of motor boating and racing. From 1911 to 1913 he was Commodore of the Thousand Islands Yacht Club near his summer home on Basswood Island in the Thousand Islands that he had purchased in 1897. His summer home was described by one source as a “palatial summer home.” In a newspaper article dated 18 August 1907 it is reported that “Society will be out in force Monday afternoon, when the annual lawn fete for the benefit of the Boys Club of Clayton will be held at the summer home of Mr. and Mrs. Thomas Gillespie at Basswood Isle, nearly opposite this resort. The affair is always one in which the society set of the Thousand Island has shown the greatest interest.” Another article in the New York Tribune dated 25 July 1920 reports that “. . .a pleasant incident of the week was the picnic which Mr. and Mrs. Thomas A. Gillespie gave to about fifty guests.” We find again another article, this time in the Watertown Daily Times in June of 1920 that informs us that Thomas Andrew and Julia Wall Gillespie’s son, Thomas Howard Gillespie was the vice President of the Thousand Island Yacht Club and that visiting the club at that time was their son Henry Lloyd Gillespie and his wife, the former Christie MacDonald “of musical comedy fame.” What it does not say but I am sure was true, that also with Henry and Christie Gillespie was their six year old daughter Christie MacDonald Gillespie, my stepmother. Thomas Andrew Gillespie was 73-years old when he died at his home on 28 January 1926. All biographies that we researched on the life of Christie MacDonald listed her as born in Pictou, Nova Scotia on 28 February 1875 and the daughter of John MacLean MacDonald, a shipbuilder, mariner, and innkeeper, and Jessie MacKenzie. Unfortunately despite hours of research I could not find anything to collaborate her birth year of 1875 other than the statement in her various biographies that she began her stage career at age 17 in the year 1892 which conveniently places her birth year at 1875. Almost all other public records with respect to her birth year suggest that she was born later and if we accept as accurate the 1900 U.S. Census records that report her birth as February 1878, then in reality when she started her stage career in 1892 she would have been only 14 years old. This might suggest that her mother may have lied about her age so that her much too young daughter would be allowed to perform but we do not think that this was the case. There is however, sufficient evidence to strongly suggest that the birth year of 1875 is not accurate. The US and NYS census records in 1900, 1915, 1920, 1930 and 1940 show the year of Christie’s birth as 1878, 1880, 1881, 1882, and 1884 respectively and not surprisingly as Christie MacDonald got older she reported the year of her birth to the census takers as being later which made her much younger than her actual age. When Christie MacDonald Gillespie traveled overseas with her daughter in 1929 she reported on the ships log that she was born on February 28, 1880 and then a year later in the 1930 census she reported her birth as 1882. Even this birth year would have made her only 10 to 12 years old when she first appeared on stage in 1892 and it is obviously a fabricated birth year on the part of Christie. On the other hand, her marriage record to William Jefferson in 1901 shows her as being 23 years old or born in 1878. Apparently William and Christie traveled to Europe on several occasions and on the ship’s manifest on one of the voyages in 1905, Christie MacDonald Jefferson again reported herself as being 23 years old. It appears that she did not age a bit between her marriage date of 1901 and 1905. Her death certificate reports that she was 85 years old when she died in 1962 which would suggest a birth year of 1877. This date shows that at least her family members believed that she was not born as early as 1875 and we suggest that Christie MacDonald’s actual birth probably occurred on 28 February 1877. Despite all of the evidence to the contrary as to her birth year, the New York Times reported in her obituary that when she died in 1962 she was 87 years old. Perhaps we will never know the truth but assuming that 1877 is the correct year of her birth, this would have made her a very young performer on the stage at only 15 and as one observer noted she was “dainty as a moss rose.” Besides, who says a woman does not have the right to fib about her age although it does appear that Christie may have taken this “right” to the extreme. The Cambridge Chronicle writing a brief story on 12 March 1898 about Christie MacDonald’s career reported that she came to Boston [with her mother and sister] when she was only nine years old and the family settled on Beacon Hill. Beacon Hill in the late 1800s was a far cry from the high-cost living area that it is today and it was in fact a location in Boston where many new immigrants in the late 1800s chose to live. Sometime in late 1895 or early 1896, the family relocated to Cambridge where the city directories in the years 1896 thru 1898 show them residing at 30 Massachusetts Avenue. Accepting that Christie MacDonald was born in 1877, then she moved to Boston around the year 1886. Since it does not appear that she was accompanied to Boston by her father John MacLean MacDonald, (at least her mother is listed as a widow in the 1896 city directory), it is possible that he may have died sometime before their departure and accepting that he had been a shipbuilder and innkeeper and had gained some wealth during his life, it seems reasonable to assume that Christie’s mother had some modest means to afford the move to Boston. Whether her decision to relocate to America and Boston was motivated by a desire to advance her talented daughter’s career is unknown and probably not likely, however the family’s move was undoubtedly based on her general conclusion that life in Boston was far better than a life for herself and her two young daughters in the rather backward and rural countryside of Pictou, Nova Scotia in the late 1800s. We must point out that we did find a few articles that implied that both of Christie’s parents moved to Boston and while this is entirely possible, we were unable to determine where and when her father John MacLean MacDonald died be it Nova Scotia or Boston. Christie MacDonald displayed a singing ability at a young age and as she once reported to the New York Times, she sang in the choir at her church in Pictou even before the family moved to Boston. Her mother saw to it once in Boston that she would be able to continue her musical studies and while there are no records of her performances in those early years prior to 1892, Christie undoubtedly performed at her school, maybe at her church, and possibly even in some small local summer theater groups prior to enrolling at the age of around 15 in Pauline Hall’s company in 1892. Apparently Pauline Hall who was an established actress and singer was in Boston along with her fellow male actor Francis Wilson, and they were preparing for the revival of the musical Erminie that they planned to open later once the show was ready, on Broadway in New York. It seems that Christie MacDonald’s music instructor may have known Francis Wilson for he was able to arrange for Christie to audition with Wilson for a part in the musical. Francis Wilson liked what he heard in the audition and Christie was chosen to sing in the chorus. Christie was undoubtedly thrilled as her aspirations to go into the theater were well know to both her mother as well as to her friends. The performance of Erminie was on stage in Boston for only one month before the cast and set were loaded out for the move to Broadway. As the story goes, Jessie MacDonald refused to allow her young daughter to leave school and Boston and move with the show to New York. Much of what we know about Christie MacDonald’s early theatrical career prior to her move to New York City in late 1898 we learn from an interesting book by Lewis C. Strand titled Famous Prima Donnas published in 1900. He begins by describing Christie’s eight years performing in the Boston theaters from 1892 until 1998 and in New York theaters in 1899 as a “soubrette experience” or as defined in other sources as one of having minor female roles in comedy. Over the eight year period Christie completed her high school education and performed in numerous theatrical productions in various theaters around Boston including the Tremont Theater and the new Columbia Theater and in a few short run shows in New York City in 1899. She was described by Mr Strand in his book as “ . . well known as a very amiable little lady with a fancy for short skirts and for frisky and vivacious characters, that sang prettily and danced nimbly.” She was not he went on to imply, destined to become a “prima donna” which was the term originally used in operas to designate the leading female singer and the one to whom prime roles were offered. This changed however, when Christie MacDonald was offered the lead role in the new musical comedy operetta The Princess Chic that opened at the New York Theater on 12 February 1900. Her new role was demanding both as an actress and as a singer and according to Lewis C. Strand in his book “she was from the first exquisite.” Unfortunately the show lasted for only 22 performances finally closing on 3 March 1900. Despite the lack of support for the show it did have the effect of elevating 22-year old Christie MacDonald into a new role as a Prima Donna. 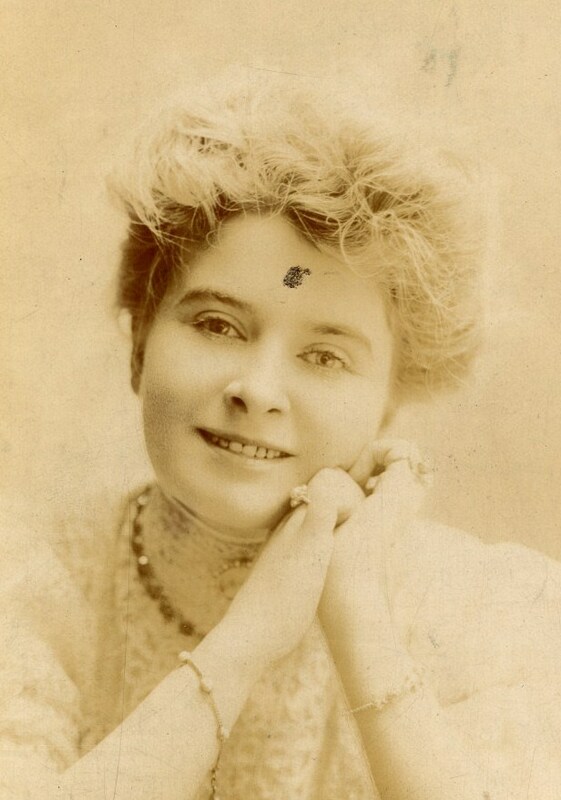 Christie MacDonald performed on Broadway in lead roles in sixteen major musicals between the years 1900 and 1920. Her final role in Florodora performed in the Century Theater in Central Park West in New York City lasted for 150 performances from 5 April 1920 until 14 August 1920 and it represented both her first stage performance since the birth of her daughter Christie MacDonald Gillespie back in 1914 as well as her final performance and the beginning of her retirement. She was around 43 years old when she retired. Incidentally, the Century Theater also retired a few years later in 1926 when it was demolished and replaced with an apartment building. We believe that Christie MacDonald’s energy in her private life was not that much different than in her public life as presented in the numerous press releases during her stage career. In a 1911 theater magazine when they described her “mid-summer repose” with her husband at Basswood Island, summer home of her father-in-law Thomas Andrew Gillespie, they reported that she loved to play golf and drive fast motor boats. In one of her many obituaries Christie was described as a “. . . favorite guest at all parties.” Christie MacDonald was probably friendly and out-going from the time that she was a young adult especially after her move to New York City and the rise of her career. We believe that she enjoyed parties and the company of others yet at the same time she retained a certain amount of innocence and perhaps naivety in her life borne from her rather humbly upbringing, the loss of her father at an early life, and the strict controls placed upon her by her mother. While it would seem that Christie MacDonald’s affair and her baby would have destroyed her marriage to William Jefferson, at least short term it appears that they tried to make it work. She appeared on stage in An English Daisy in January and February of 1904 and in the spring she and William sailed for Europe for a long vacation that was obviously meant to mend their marriage. They returned to America on 1 August 1904. She then traveled to their summer home on Buzzard’s Bay on Cape Cod before returning to New York to prepare for another performance this time in the musical comedy The Sho-Gun which was to run from 10 October 1904 until 21 Jan 1905. In the meantime, William landed his first major role in a play that ran from August to November of 1905. We have to believe that they were both so busy as to make it virtually impossible to make their marriage work, if that were even possible. Immigration records show that they made one short final trip overseas together before returning on 18 April 1906. Our research did not yield the actual date their divorce was granted but we believe that it was sometime in early 1910 as Christie filed for a divorce in Buffalo, New York in late 1909. It is assumed that they had been separated for several years before the divorce settlement. William Winter Jefferson never remarried and he died at the age of 69 in 1946. Christie MacDonald began dating Henry (“Buddie”) Lloyd Gillespie sometime in mid-1910. He was 32-years old, a year or so younger than Christie; he had never been married and by any standards he would have been considered an excellent catch. Henry was a graduate of Yale University and the son of the very wealthy contractor James Andrew Gillespie who undoubtedly employed his son as well as helped him financially in Henry’s many investment opportunities. In the 1900 U.S. Census 22-year old Henry was listed as a “Contractor” and undoubtedly he was working in some capacity for his father’s company. By the 1910 U.S. Census, Henry L. Gillespie listed his occupation as “Real Estate” which we interpret to mean that he invested in real estate opportunities. Five years later and following his marriage to Christie MacDonald, he then listed his occupation in the 1915 New York Census as that of a “Theatrical Manager,” again because he invested in theatrical products like his new wife’s shows on Broadway. During World War 1 Henry again changed occupations, at least on paper, when he listed his occupation on his draft registration card in 1917 as that of the “Assistant General Manager” of the T.A. Gillespie Loading Co. There is no evidence that suggests that he had any training or experience to handle this elevated position or his subsequent positions in the construction industry. Henry Lloyd Gillespie had the good fortune to have been borne the son of a multimillionaire whose father was generous with his money, and as such Henry had both the money to dabble in various investments and the ample free time to enjoy his good life. He undoubtedly was an excellent choice as a husband for Christie MacDonald. For some reason Henry and Christie chose to keep their wedding a secret at least from the public. They began dating sometime before the grand opening of The Spring Maid at the Liberty Theater in New York City that began the day after Christmas in 1910. Their marriage actually took place in November of 1910 but it was not announced until the late spring of 1911 following the summer close of The Spring Maid. Henry and Christie were onboard a ship headed for Europe for their honeymoon when Christie’s sister Belle MacDonald made the surprise announcement to the press of the couple’s previous November marriage. The couple spent their honeymoon in France. They returned in late July spending a week at Henry’s family summer home in the Thousand Island before returning to New York on 7 August 7 1911. Apparently the marriage of Henry Lloyd Gillespie to Christie MacDonald was a success at least at the beginning. Christie completed her performance in the highly successful The Spring Maid in February 1913 followed by another show Sweethearts that ran from September 1913 until January 1914. In February of 1914 the Gillespie’s announced that Christie was expecting a baby and understandably her stage career came to an abrupt halt. On 10 November 1914 their daughter and only child Christie MacDonald Gillespie was born. In the 1915 New York State Census we find them living in an new and exclusive apartment building at 800 Riverside Drive in New York City that was obviously large enough to house the entire family that included Henry and Christie, their 6-month old daughter, Christie’s 75 year old mother and her 36 year old unemployed and unmarried sister, and three servants. There is every reason to believe that Christie was delighted with this arrangement and the change in her life. Christie MacDonald appeared in her last major show Florodora that ran from 5 April 1920 until 14 August 1920 before retiring. She was at the top of her career when she retired in her early 40s. As far as we can determine the marriage between Christie MacDonald and Henry Lloyd Gillespie was without any major problems. We do find it kind of unusual however, to discover in the immigration records that Henry traveled abroad every year to Europe beginning in the year 1926 and continuing until 1929, the year of his death, apparently without his wife Christie. This arrangement might be explained by the fact that Christie preferred to stay home with her young daughter. In the 1920 US Census, Henry listed his occupation as a “Building Contractor Houses” so it seems unlikely that he was traveling to Europe on business. While it is possible that Henry was returning to America without Christie every year because Christie elected to stay behind in Europe to extend her vacation, we did find it confusing that we found only one immigration record of Christie returning to America during the 1920s and that was in April of 1929 when she was traveling with her 15 year old daughter and without Henry who had returned in late January of that same year. Unfortunately, just days before Christie arrived back in New York, Henry died of pneumonia on 15 April 1929 at their temporary home which at the time happened to be at the luxury St Regis Hotel in mid-town Manhattan. Henry’s death was totally unexpected and he was only 51 years old at the time. Christie MacDonald and her daughter Christie remained in New York City until the middle of the 1940s. We know primary from discussions with Christie’s daughter, my stepmother Christie MacDonald Gillespie (see adjacent photograph), that she and her mother traveled at lot during the 1930s both in Europe and within the United States, before my stepmother married George Ralph Spivey in New York City on 20 March 1943. Sometime after their marriage young Christie, who was now 29, and her new husband returned to his home state of California where their son John was born in 1944. Sometime after 1945, Christie MacDonald, the mother, purchased a home in Westport, Connecticut probably with her daughter and her husband George Spivey who had returned with their son from California. Christie’s and George Spivey’s second son Henry, whom they nicknamed “Buddie” after his grandfather, was born in Connecticut in 1948. Christie MacDonald and her daughter Christie lived together as they had done almost their entire lives until the Prima Donna’s death on 25 July 1962. Christie MacDonald was 85 years old when she passed away. She never really gave up the theater however, and as one obituary described her, she was an “active doyenne of the Westport theatrical colony, a frequent patroness of theatrical events and favorite guest at all the parties.” Somehow, this is not surprising. Christie MacDonald Spivey lost George Spivey to death in 1949. She remarried a John Bradley Fanton in 1951 and they remained married until John’s death in 1970. Christie Fanton remained in her Westport house where she had lived with her mother and two husbands until she married my father in 1974 and together they returned to my father’s home in Lewiston, New York. She died on 9 January 2003 in Lewiston. So ends the story of my stepmother’s very interesting ancestors. Read with great interest your blog post. My grandfather, Anthony J. Marino, was listed as the illegitimate son of CM and Senator Timothy D. Sullivan. As a family genealogist and professional historian, Mr. Marino, I can state with absolute certainty that he never brought claim for any monies. Mr. Marino was placed in the NY Foundling Hospital (I have the actual adoption papers) by an individual listing herself as "C. MacDonald" and the father as "Timothy Sullivan." I think I can sum up my grandfather's sentiments about this rather succinctly when he wrote, "I wanted nothing more than to be a son to her."